The Pulitzer-Prize-winning musical, which also won the Olivier Award for Best Musical, is playing the Carnival Studio Theater, located inMiami’s Adrienne Arsht Center through Feb. 12. This production, the South Florida premiere of the musical, combines striking stage pictures, stark lighting by Rebecca Montero, eye-catching video projections by Greg Duffy and top-notch singing voices from a talented cast of veterans and younger thespians who nail Sondheim’s complex music. They are accompanied by a vibrant, live orchestra. notable painting “A Sunday Afternoon on the Island of La Grande Jatte.” Sound effects of chirping birds, created by sound designer Dan Mayer, reinforce the serene atmosphere. Seurat created the work, considered his most famous, in the form of a painting technique called Pointillism. It involves small, separate dots ofcolor applied in patterns to form an image. The image mostly comprises members of the French bourgeoisie relaxing on lazy, sunny Sundays on the island. In the show, the painting’s subjects spring to life, commenting on various subjects, including Seurat’s endless concentration while he works to paint likenesses of the people. 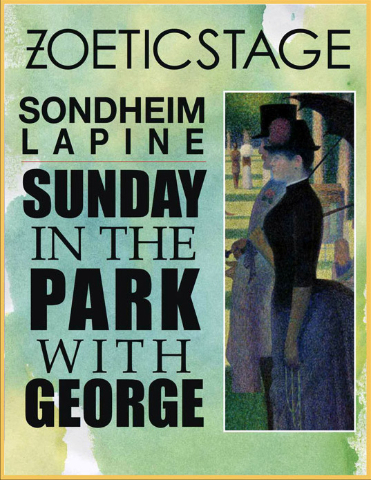 Director Meltzer’s smart staging includes ensuring a separation exists on-stage between the aloof Seurat (Cooper Grodin) and the rest of the characters. Grodin projects a dark and serious aura without making his character unlikable. Like his painting, his performance is multi-colored, withinjections of charm and playfulness. As Dot, Kimberly Doreen Burns invests her character with impatience and exasperation at Seurat’s demands and neglect of her. But Burnsalso communicates her character’s devotion to Seurat, at one point seductively touching his body from the top to the bottom, as thoughhe’s a work of art himself. The first act takes place in 1884, while the second fast forwards to a museum in 1984 New York City. In the latter, Georges’ great-grandson, named George, is a struggling painter trying to preserve his ancestor’s painting. With him is Georges’and Dot’s now-elderly daughter, Marie (also played by Burns, who looks too young and acts too vibrantly in the role). The importance of art as a family legacy and the challenge of producing art are among the timeless themes in Act II. George is played by Grodin with a strong sense of commitment and a sense he’s burdened by the hard task of producing art. Grodin makes itclear there's a weight on this man's shoulders to preserve his great- grandfather's legacy. “Art isn’t easy,” are lyrics that are repeated in the song “Putting it Together.” It’s sung by Multiple characters, including George. The song,like others in the musical, showcases Sondheim’s brilliant rhymes and elegant lyrics. chest’s worth of tempting choices. Maybe art’s infinite possibilities make it so tempting to try to create. Carnival Studio Theater within the Adrienne Arsht Center For the Performing Arts of Miami- Dade County.